Hadrian's Wall passes along the north side of Heddon on the Wall village. Although General Wade's Military Road (now the B6318) overlies most of the Wall in this area, a section over 255m long has been consolidated and in the care of English Heritage just east of the village. This represents a section of the planned 'broad wall'; other sections of the structure were reduced in thickness to save time and resources. The Wall was built on the orders of the Emperor Hadrian and commenced in 121 AD, stretching from Wallsend (Segedunum) in the east to Bowness on Solway in the west, a distance of about 73 miles. The remaining section of the Wall here was gifted to the Society of Antiquaries of Newcastle by Sir James Knott in 1924. This information and the diagram taken from Richard Devine The Northwest Frontier of the Roman Empire Chap 2 p. 27 (﻿Hadrian's Wall Camera﻿). A milecastle and turret system along the Wall provided two turrets between each pair of milecastles. Heddon village probably grew up around the 12th Milecastle (counting from Wallsend in the east). The site of the milecastle has never been found [although see here], but probably stood on the hilltop to the north-east of the church which used to be the site of Mushroom Row cottages (now demolished). According to Rev. C. Bowlker, a former vicar of Heddon, writing in 1885, the people who lived in these cottages, when digging a hole in front of them for burying a horse, came upon old foundations and what they described as a grave-stone with letters on it. This may have been a Roman altar or centurial stone, but was unfortunately destroyed. Dr Lingard in 1807 described two Roman inscribed stones in Heddon, on the left of and above the door of the coach house and although they subsequently went missing we still have contemporary drawings made by John Bell in 1817. The inscriptions indicated that parts of the Wall at Heddon were built by the Fourth Cohort of the Twentieth Legion, Valeria Victrix, and the centurial stone inscribed by Julius Rufus. Its discovery was made by John Clayton around 1883. The ditch on the north side of Hadrian's Wall is visible around 2m in depth in the wood at the north edge of the road at Great Hill east of the existing stretch of Wall. The Vallum, although disturbed by 5m to 6m wide ridge-and-furrow ploughing, is still visible as an amorphous ditch 0.2m to 1.6m deep in the field between the existing Wall and the housing estate. The north and south mounds have been ploughed out. The first ever excavation of the Vallum was undertaken at Great Hill, Heddon on the Wall in 1893 (Soc Antiqs Newcastle 1894), where it was observed that the Vallum ditch was cut through a seam of fire-clay which was deployed in both mounds – this single excavation demonstrated that the main north and south mounds were both contemporary, and built using material won from the ditch. 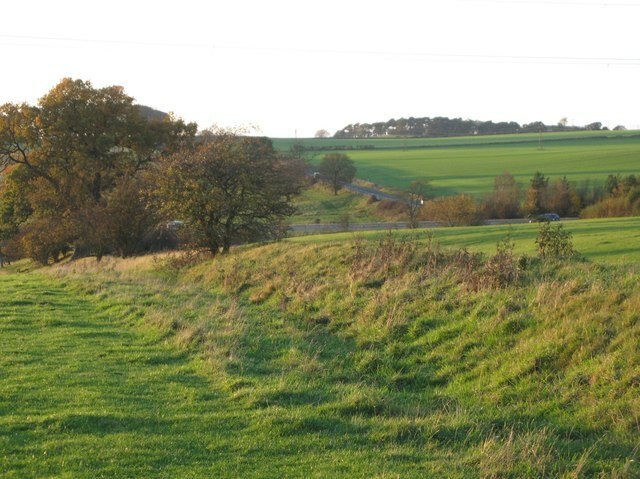 The line of the Vallum can be partly followed through the village, north of the church, by a sunken lane known as Chare Bank. Part of the vallum ditch opposite the Three Tuns used to be flooded and formed the village pond. It was later filled in for construction of the Memorial Park. Medieval kiln in Hadrian's Wall (1884) - A History of Northumberland vol.13 p528. I have never seen an adequate explanation of how it came about that the existing stretch of Wall avoided becoming the road foundations that otherwise cover it on the Hexham road from Throckley and westwards from Heddon on General Wade's Military Road built c1752 after the 1745 Jacobite Rebellion. The bend in the Wall preserved at Heddon gives two sections which precisely align with the Hexham Road and Military Road, respectively east and west of the village. The road, otherwise built on its foundations, took a different line from the Great Hill westwards, a more gradual bend taking it to the north of the Wall. It rejoins the line of the Wall again, in the vicinity of the filling station. The bend of the road away from the line, resulted a fine portion of the Wall being preserved at Heddon, little more of the curtain structure being visible between remaining sections at Denton in the east, to near Chollerford in the west. Perhaps a gradual bend may have been more beneficial for a road on the steep slopes of Great Hill, utilising the northerly Wall ditch already cut through the rock at this point. It may also have been done to avoid the wet ground below the hill (in the vicinity of the Wall on its west side), or just to by-pass existing buildings on the east side of the village, in the vicinity of Town Farm. The Wall and Vallum approach very close at this point. There is a persistent rumour in the village that the portion of the Wall we see today was actually moved to its current site, possibly following the road improvements to lower the course of the road over Great Hill in 1926. However, both myself (and English Heritage, who gave it Ancient Monument status) consider this unlikely. The divergence of the road from the Wall line here was described by Collingwood Bruce in 1851. Hadrian's Wall at Heddon. Photo A Curtis (2011). The berm and the Wall itself are here overlaid by the modern footpath and road. The ditch was shown to be cut through shale and was 27 feet wide. At the centre, the ditch was wide and flat, 6ft 10" deep with the scarp slope steeper on the north side. He reported that the water main from Whittle Dene Reservoir follows the line of the centre of the Wall ditch from the east side of Rudchester fort to enter the village. From various places in this section of the Wall there are wide views northwards towards the Scottish Border and south west along Tynedale to the North Pennines. At the east end of this section, the Wall survives as a buried feature below the course of the modern road, the B6528. Its line was recorded during roadworks in November 1926 to lower the gradient of the road at Great Hill and was found to be of broad wall type. In the west end of this section there is a 255m stretch of upstanding consolidated wall between 2.8m and 3m in width, reaching a maximum height of 1.7m. The core was originally set in puddled clay, but is now reset in mortar to preserve the work. The upstanding section of the Wall is in the care of the Secretary of State. Turret 11b was located by excavation in 1919. It survives as a buried feature below the B6528 near the top of Great Hill. The location of Turret 11a has not yet been confirmed though it probably lies along the line of the Wall somewhere opposite the former Royal French Arms public house. In 1879 a hoard of over 5000 silver Roman coins was found in an earthenware vessel just to the south of the Wall, below the main road, somewhere to the east of this turret site near Throckley Bank Top (in Tyne and Wear). The coins were of the period AD260-270. Coins and medals deposited in a number of wooden boxes were discovered in Heddon during the making of the road in 1752. Another group of coins dating from AD 286-408 was found around 1820. The Wall ditch is thought to survive as a buried feature underlying the gardens of the houses to the north of the Hexham Road (B6528). However, west of the houses the ditch survives as an earthwork with a maximum depth of 1.9m and there is some rubble strewn over its scarps. In the west end of this section, opposite the consolidated stretch of Wall, is a section of ditch, also in the care of the Secretary of State, which reaches a maximum depth of 1.4m. The vallum survives as an earthwork in the field south of the B6528. It lies about 50m south of the Wall line along this stretch of the corridor. In the east end of this section the vallum mounds have been reduced by ploughing, although the vallum ditch is still visible, reaching a depth of up to 1m. It is most evident in the east end in the small stand of trees at the entrance of the drive to Heddon Hall. On the summit of Great Hill, however, the works of the vallum are very well marked. The ditch is cut through the freestone rock and the south scarp shows Roman tool marks. The course of the Roman road known as the Military Way, which ran along the corridor between the Wall and the vallum linking the turrets, milecastles and forts, is not yet confirmed in this section of the corridor. Excavations of the berm (between the Wall and its north ditch) in 2002 for a water pipe along the Throckley Road from a point just east of milecastle 11 (measured location at Throckley Bank Top) as far as the location of turret 11b on Great Hill, uncovered 145 pits some retaining the impressions of two upright stakes. Such structures, known as ‘cippi pits’ have also been found at other locations along the Wall in the Newcastle area, and on the line of the Antonine Wall, and have usually been interpreted as being defensive structures. It was assumed that branched, sharpened stakes in the pits could have acted like barbed wire. 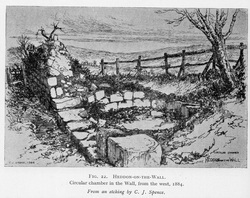 Bidwell, P T, 2005 'The system of obstacles on Hadrian's Wall; their extent, date and purpose', Arbeia J, 8, 53-76. An alternative theory proposed by Geoff Carter in July 2009 is that they are the remains of a wooden ‘box rampart’, which was erected as a temporary barrier whilst the stone wall was built behind it. The same author also makes a strong but unconventional case that the Vallum was originally conceived as a road. However, there appears to be little evidence to support this. Remains of Hadrian's Wall, reconstruction and 'cippi pits' near Segedunum, Wallsend. Photo A Curtis (2013). This section of Hadrian's Wall, its external ditch and the vallum runs from Heddon-on-the-Wall in the east to the A69 trunk road in the west. It has wide views overlooking the Tyne valley to the south and east, whereas to the north and west the ground rises gently giving a less extensive view. The Wall survives as a buried feature for the whole of this section of its course. It lies beneath the B6318 road except at the west end of this section where it continues in a field up to the A69 trunk road. The Wall ditch survives as an earthwork for much of this section, to a maximum depth of 1.5m. The upcast counterscarp, usually known as the 'glacis', also survives up to 0.3m high in the area from north of the Three Tuns Inn to the north of North Lodge. Turret 12a and Turret 12b survive as buried features below the B6318 road. Their locations are known from excavation by Simpson in 1930. The exact location of Milecastle 12 has not yet been confirmed. In relation to the known sites of turret 12a and turret 12b, the site is expected to lie in the vicinity of Keeper's Cottage at Heddon-on-the-Wall. The upper levels of the Vallum ditch were excavated as part of an archaeological evaluation. Analysis and dating of the deposits showed that the ditch had been a large open feature in the 10th and 11th centuries and had been used to dump both domestic and industrial waste. The industrial waste showed that grain processing and possibly metalworking were being carried out nearby and that Heddon was a settlement of some importance in the early medieval period. The vallum survives intermittently as an upstanding earthwork throughout this section. The mounds have been reduced by ploughing and the central ditch has silted up for most of its length. The south mound in this section reaches a maximum height of 1.5m, while the ditch has a maximum depth of 0.6m. The course of the Roman road known as the Military Way, which ran along the corridor between the Wall and the vallum linking the turrets, milecastles and forts, has not yet been confirmed in this section of the corridor. An evaluation on a disused section of the B6318 west of Heddon (NZ 12406725) revealed the foundations of Hadrian's Wall. They comprised a single layer of sandstone blocks less than 0.4m below the modern road surface. The blocks were the southern face of the Wall which had a clay bonded core of smaller angular stones. There were layers of clay above and below the Wall. On top of the Wall were 18th, 19th and 20th century road surfaces. There were no built up deposits on top of the Wall, which suggests it had been cleaned or reduced to a single course before either the 18th century or modern road was built. 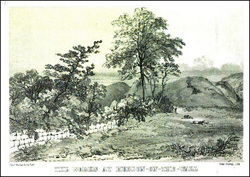 The Roman fort of Rudchester (Vindovala) guards the valley of the March Burn. It covers an area of 1.8ha and would have accommodated a part mounted cohort, 500 strong. The Vallum west of Heddon-on-the-Wall. Photo by Mike Quinn (2011). The Vallum between Heddon-on-the-Wall and Rudchester. Photo by Mike Quinn (2011).